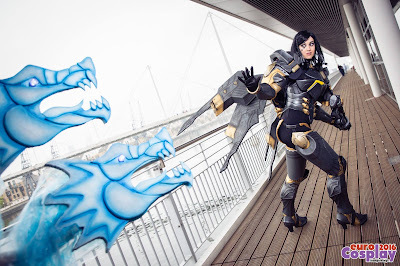 Good prop can make your cosplay performance much more interesting and get you a much better score in a cosplay contest. So even it is true you can do a good performance even without any prop, don't underestimate their effect! 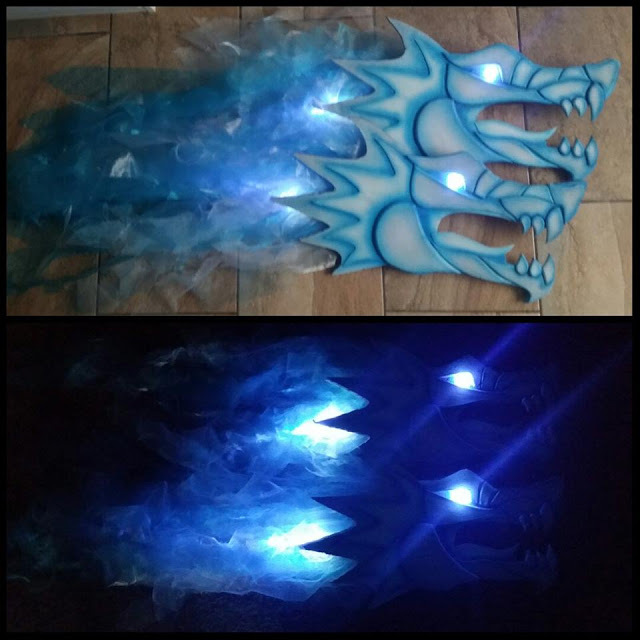 I decided to make two blue spectral dragons as props for my cosplay performance on Eurocosplay contest 2016 in London. Even the didn't make it to the stage due to some problems in backstage #nodragons, I still thought this small tutorial can be useful for you in making light shining spectral-like effects for your cosplay or an idea how to make a prop like this. I started with a big paper, where I drew the simplified shapes of my dragons, that I've tried to make a little similar like the ultimate dragon shapes in game. 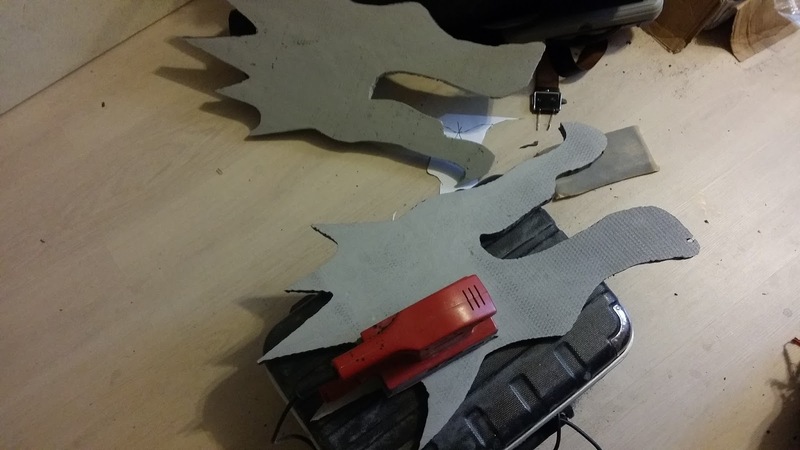 I transfered the outline of the dragon heads onto a big hardened XPS polystyrene sheet (the grey one), that was about 2,5 cm thick and I cut the shapes out. 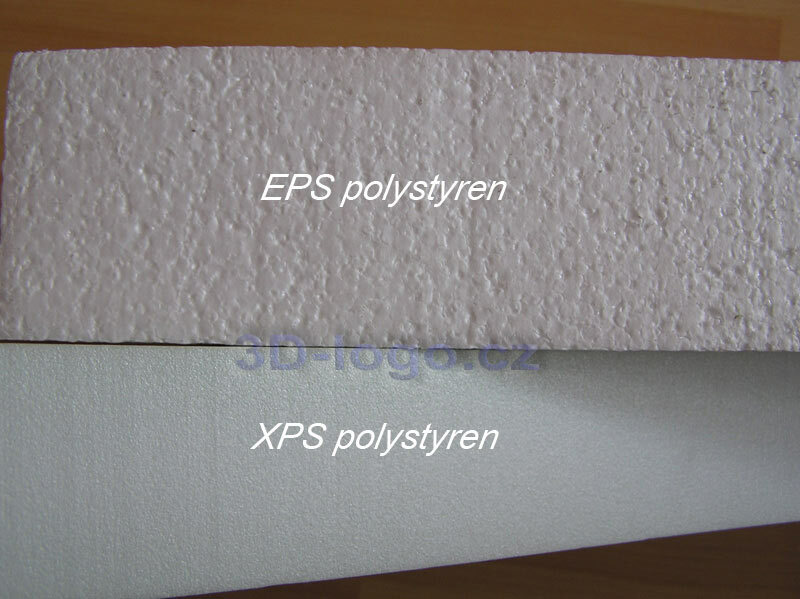 For the cutting, you can use an exacto knife or a saw, but a little easier is to use the polystyrene cutting tool with hot edge, that actually burns the polystyrene. I did'n cut out the shapes of the teeth and tongue - these small parts could break. 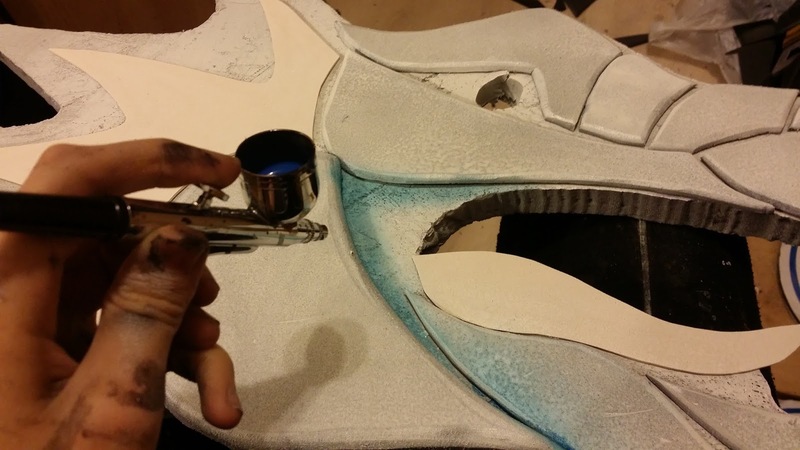 As I had a polystyrene sheet with some kind of pattern on it, I sanded the pattern out to have a smooth surface. 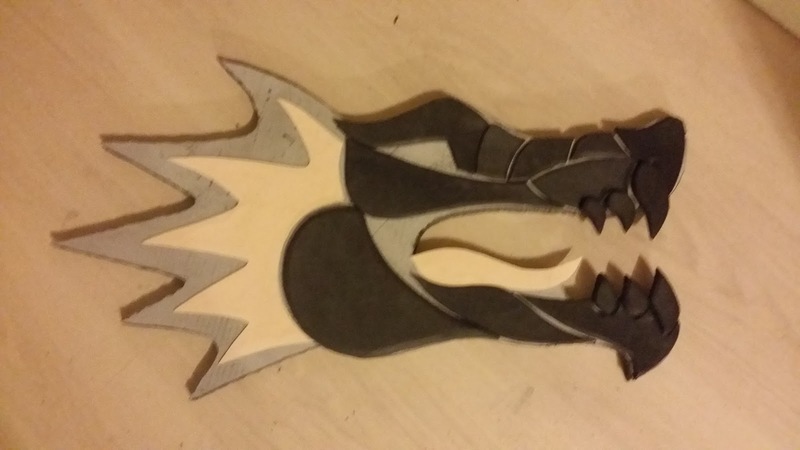 Then I drew on the paper simple shapes of the dragon's head parts and I cut them out of craftfoam and EVA foam, dremmeled the foam to have smooth edges and I glued it to polystyrene with hotglue - be careful to use the right temperature, because if the hotglue is too hot, it will burn the polystyrene, if it is too cold, it wouldn't be sticky. Or you can use polystyrene glue. Then I made a hole in the eye are for my small flashlights to fit in just right. 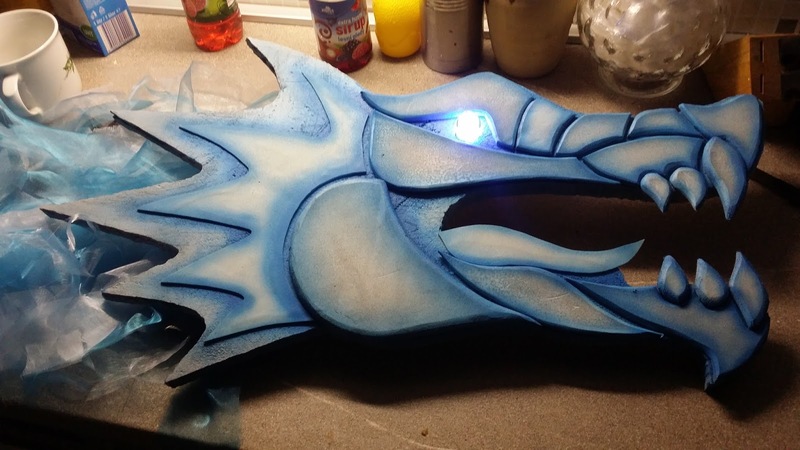 I spraypainted the whole thing with white acrylic paint in 4 coats and then I tried to paintbrush the thing with different shades of blue - I've used darker colors in the chinks and lower based places and I've used lighter colors in the higher based places or middle parts of the foam. Then I cut the white packaging stuff and a blue document foil and I put this into the cover of the flashlight to difuse the light just right. 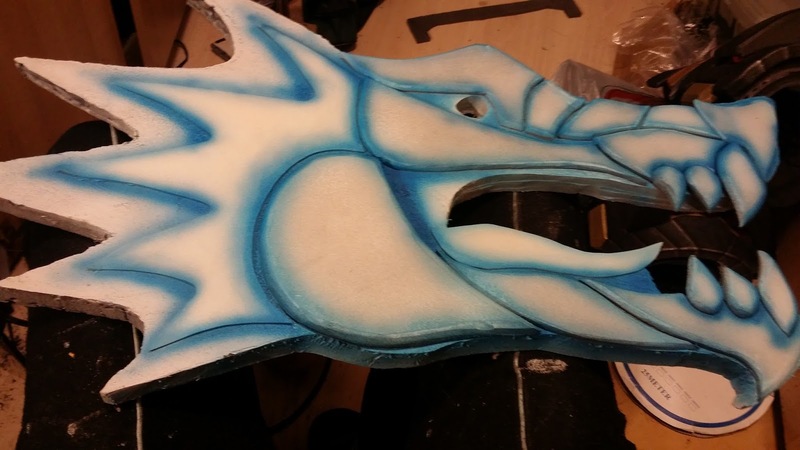 Then I took different shades of blue and blue-white organza, cut it in straps and made teeth in the straps for better volume and shape and glued them randomly to the back of the dragon's head. A tiny flashlight was glued from the back of the dragon head too and this flashlight doesn't need to be difused. I've included all the patterns in following PDF DOCUMENT and this picture as a guide for you. 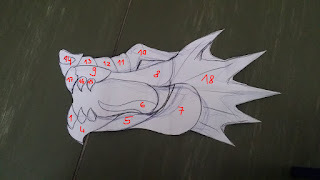 The numbers in the document have also a letter included - the letter marks, how thick is the foam used for the particular part of the dragon - A means 2-3 mm thick craftfoam, B means 0,5 cm thick EVA foam, C means 1 cm thick EVA foam.